To add a Smart Filter to a layer, you first need to turn the layer into a Smart Object, if it isn’t one already. To do this, first select the layer, then choose Filter > Convert for Smart Filters. 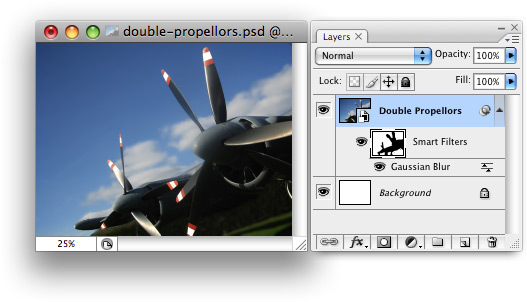 To apply a Smart Filter to a layer, you first need to make sure the layer is a Smart Object. When you apply a filter to a Smart Object — in this case, a Gaussian Blur filter — a Smart Filter is created and displayed in the Layers panel. As you can see from the above screenshot, the Smart Object now has a little lens filter icon next to it in the Layers panel, as well as the Smart Filters item below it. The Smart Filters item contains the thumbnail for the filter mask, and the Smart Filters themselves appear in a list below the Smart Filters item. So far, a Smart Filter doesn’t seem that much different from a regular filter. However, here’s where the fun begins! 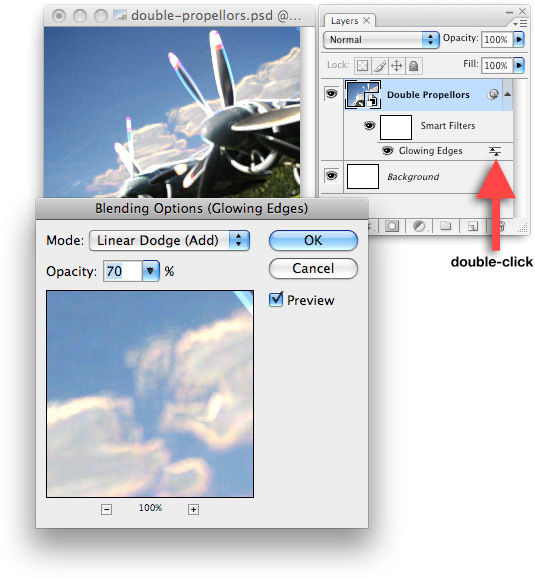 Double-click the Gaussian Blur Smart filter in the Layers panel to re-edit the filter’s settings. Toggle a filter. 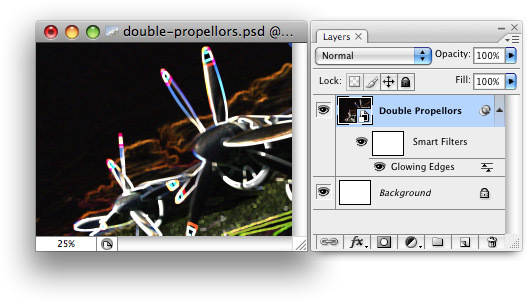 Click the eye icon next to a filter in the Layers panel to turn the filter effect off or on. You can also click the eye icon next to the Smart Filters item to toggle all filters for that Smart Object. Reorder filters. You can change the order that Smart Filters are applied to a Smart Object by dragging the filters around in the Layers panel. Since the order that filters are applied can dramatically affect the final result, this flexibility lets you create all sorts of interesting effects. Move/copy filters between Smart Objects. Want to apply a filter to a different Smart Object instead? Just drag the filter to the new Smart Object in the Layers panel. To copy a filter to another Smart Object, hold down Alt (Win) or Option (Mac) while you drag. You can also duplicate filters within the same Smart Object by Alt/Option-dragging. Delete Smart Filters. To permanently remove a Smart Filter from a Smart Object, drag it to the trash icon in the Layers panel. To delete all Smart Filters for a Smart Object, drag the Smart Filters item to the trash icon. Filter masks add a whole new dimension to Smart Filters. By painting in black (or shades of grey) on a filter mask, you can mask off the effect of the filters in certain parts of the image. This allows you to apply filters selectively to the areas of the image that you want to affect, while leaving other parts of the image alone. Each Smart Object that has Smart Filters applied to it has its own filter mask. You can see the filter mask thumbnail in the Smart Filters item in the Layers panel (shown in the screenshot below). Select the filter mask. Click the filter mask thumbnail in the Layers panel to select it. You’ll see a border appear around the thumbnail. Draw on the filter mask. Pick a black foreground colour and a brush, and start painting on the filter mask in the document window. To make the masking effect more subtle, paint with a lighter shade of grey instead of black. Deselect the filter mask. To return to working on the Smart Object instead of its filter mask, click the Smart Object’s thumbnail to reselect it. As well as drawing on a filter mask with a brush, you can fill the mask with a gradient using the Gradient Tool, which is great for fading a filter effect out from foreground to background in the image (or vice-versa). Another handy technique is to select an area of an image to mask by using the Magic Wand or other selection tool, then filling the selection with black. 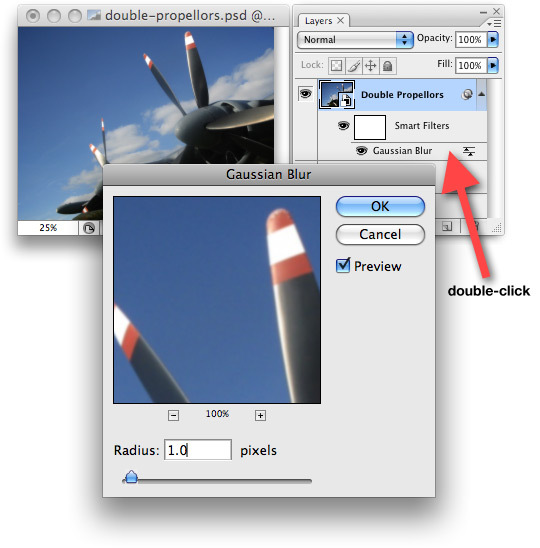 Select the filter mask by clicking its thumbnail, then paint black on the mask to mask off the blur effect from the planes in the foreground, keeping them sharp. If you want to disable the effects of a filter mask, thereby applying the filters to the whole image again, you can Shift-click the filter mask thumbnail. Shift-click it again to re-enable the mask. By the way, you can load a filter mask as a selection by Control-clicking (Win) or Command-clicking (Mac) the filter mask thumbnail. The last great feature of Smart Filters that you’ll explore here are blending options. You can change a Smart Filter’s blend mode and opacity by double-clicking the little sliders icon on the right-hand side of the Smart Filter in the Layers panel (see the screenshots below). The Glowing Edges filter gives a nice effect, but loses much of the original image. By setting the filter’s blend mode to Linear Dodge (Add) and reducing the opacity to 70%, you get a more subtle effect that blends nicely with the original photo. Create a variety of effects by changing Smart Filter blending options. Nice tutorial. Keep them up! Thanks @mguerra79 and @DebG. 🙂 I’m glad you enjoyed the tutorial! Smart Objects in CS2, Smart Filters in CS3.